Him: Not so simple, getting lowballed and the brokers coming up with buyers are really just trawling for the listing. Me: What do you mean lowballed? What are you asking? Me: There’s your problem right there. Him: What do you mean? It’s a junior four in the East 70’s with one bath, what should I ask for? Him: What the hell are you talking about? It has one bedroom and a dining room that converts to a smaller bedroom. Me: So what? Its’s New York City, just list it at $10 million and watch the buyers roll in to fight over it. Me: No, trust me. Once you list something over $10 million, your bring out a whole new class of buyer. People who don’t even get out of bed for a million dollar listing. The only people coming to look at a one million dollar apartment in Manhattan are hobos. Right off the freight car from New Jersey. You don’t want to deal with these people – they need, like, mortgages and ****. You want to deal with the ten million crowd, trust me. They show up with a check and a pen. Me: It’s worth whatever you say it’s worth! This is New York City in 2014 – the way it works is you name the most ridiculous price you can think of and, out of thin air, a hundred people who are dying to pay it just materialize and start making offers. Homes, buildings, clothing, shoes, artwork, companies, office space, gym memberships, jewelry, groceries, meals, a round of drinks – money is literally no object anymore, you’re restricted only by your own imagination. Me: Yo! Let me tell you a question: Shut up! Me: Look man, New York City is a magical land where people just make up a price and then buyers kick the door down and start paying it. My friend has five kids, all at a Manhattan private school, do you know what he pays? Me: $46,000. Per kid. Quarter million a year for school. Not including school trips, school uniforms, athletic equipment and donation drives. Forty **** six thousand dollars per kid, for eight months a year. And do you know where that number came from? Me: He doesn’t either. No one does. It’s based on nothing. Why not $45,000 or $51,000? No reason. Someone came up with $46,000 and everyone just said fine and paid it. I bet if they were to double that price, they’d still fill the school with kids and parents who just don’t give a damn or are too busy to argue. That’s how New York City works. Also, nobody wants to be seen arguing or questioning the price for anything. They just pay. It’s amazing. No where else in America is there anything like this. If you can’t sell an apartment for a price unconnected to reality here, I don’t know what to say. Me: And I’ll tell you another thing – lose that “East 70’s” crap, nobody wants to hear that! There’s no cache in East 70’s. If your neighborhood doesn’t have a name – like NoHo or DUMBO or TriBeCa, you might as well kill yourself. Me: Sure it does. You live in TBAG. Me: TBAG – Two Blocks from Atlantic Grill. That’s your hot, up-and-coming neighborhood’s name. Get a reporter from New York Magazine to use the term TBAG in an article somewhere, they’re basically out of things to write anyway, they’ll do it. Tell people you’re getting another SoulCycle next door and a new branch of Lavo up the street and then sell the place to a Russian or a Chinese guy for $10 million. Him: I guess I never thought of that. Will give it a shot. Me: I’m just getting word on Curbed.com, TBAG’s no longer a hot neighborhood. Him: But you just made that **** up two seconds ago! Me: Look man, I can’t control the trendiness of your loser neighborhood. You had your window of opportunity and you pissed it away. You’e probably going to die in that apartment. Get used to it. 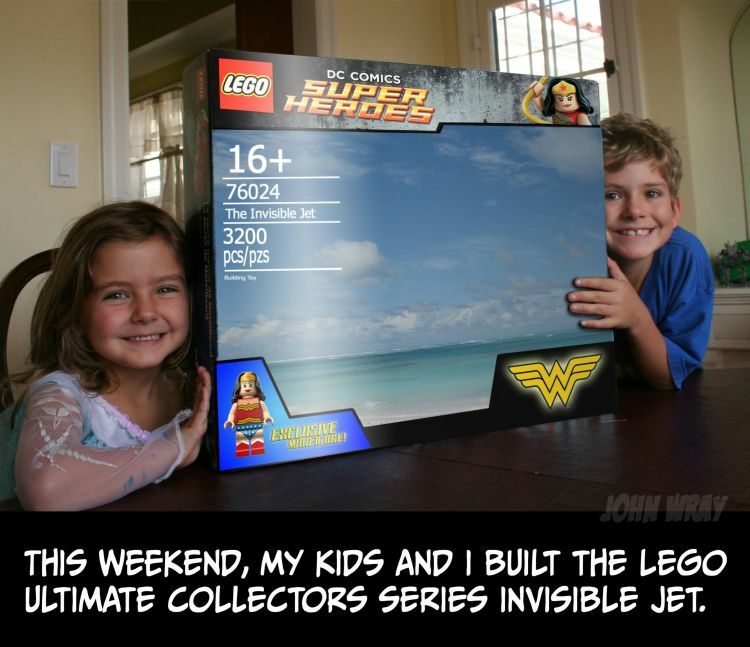 I like this guy (and his kids) and the humor. 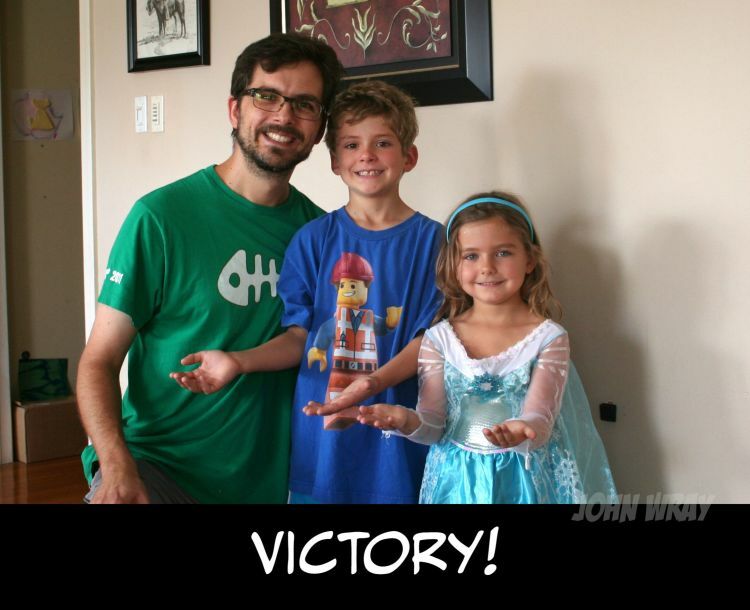 Animator John Wray and his two kids posted a series of adorable photos of themselves pretending to build Wonder Woman’s famous invisible jet out of LEGO. 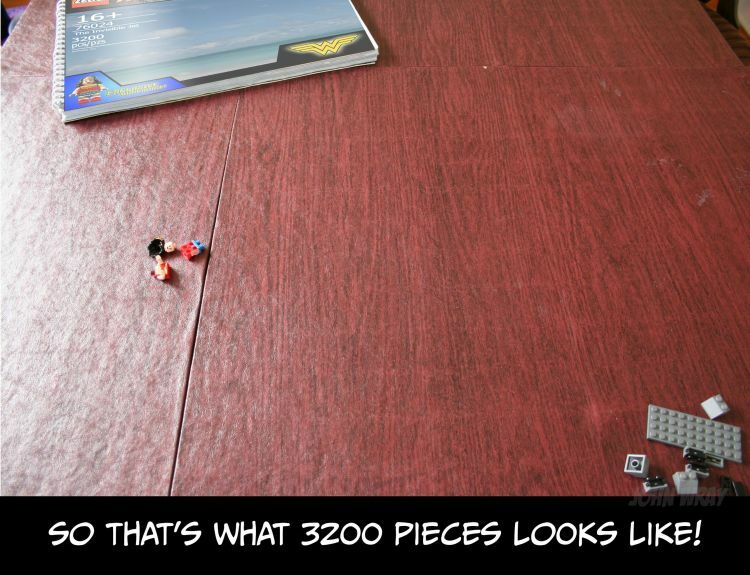 The photos show detailed versions of the LEGO box and instructions for the set, the “invisible” pieces themselves, and the proud family holding the finished product. OK, I laughed a lot at this. At times, Pitt seems to be trying hard not to crack up; at other times, he looks appalled. But he manages to make a pitch for his charity, Make It Right, and for his new movie, Fury – even if Zach pronounces it "Furry." You can't help but laugh at the absurdity of it all. I'm surprised that this show ever existed let alone was something I actually watched when I was a tyke. The most disturbing thing in this clip is not Pee Wee, but the fact that there were dudes that actually dressed up as Barry Gibb just to score with the ladies.Apparently it worked. Didn't know where to post this. Since it made me laugh enough times, figured this was the appropriate thread. I've seen something like this before but it's making the rounds again so I thought i'd share it. Airplane Vs Zero Hour.